Sam Anton in Americas Editor's Picks Travel on 24 January, 2018. Between June and August 2017, I spent over two months in Canada, where I worked on a quintessentially North American summer camp. My position was a ‘counsellor’ – not to be confused with the British definition of the word – which meant leading my 10 and 11-year-old Canadian children around various sports, educational activities and recreational events. ‘We go on camp to have fun’, declared one of my campers. And, although tiring and at times stressful, it was essentially that: fun. More than 550 campers over the course of the summer, as members of staff, we indulged in the craziness of camp. The camp was located just outside the small town of Parry Sound. This town lies on the eastern shore of Lake Huron – one of North America’s five Great Lakes – and is located almost 250 km to the north of Toronto. 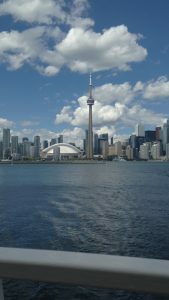 Toronto, with a population of nearly five million people, acts as the economic capital of Canada and as the political capital of the country’s most populous province: Ontario. The quiet, leafy streets of Parry Sound, whose population only exceeds five thousand, act as a striking contrast to the bustle and lights of downtown Toronto. Both Parry Sound and the camp itself are surrounded by stunning fresh-water lakes, evergreen pine-forests, deep woodlands and quaint Canadian cottages. Summers in southern Ontario are consistently warm, and the sunny, temperate weather made the camp – with its strong focus on outdoor activities, games and exercise – come alive. 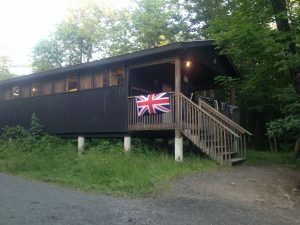 The Canadian national anthem – which both staff and campers alike had to sing every morning before breakfast – declares that the country is the “true north strong and free”. Canadians frequently call their nation the “great white north”, and any trip to Ontario between November and February makes it not particularly hard to see why. January temperatures in Toronto, although a city on the same latitude as Paris, often fall to -20 degrees. The warm, sultry days of southern Ontarian summer appear something of fantasy during the depths of winter. Yet the words “great white north”, in fact, have a darker, somewhat discomforting history behind them. British settlers to Canada brought with them the philosophy of ‘Manifest Destiny’: the belief that the fate of the North American continent lay in colonisation by Protestant, Anglo-Saxon whites. Great Britain, over the course of the 17th, 18th and 19th centuries, established, and then encouraged emigration to, the settler colonies of Canada, Australia, New Zealand and South Africa. British governments also consistently advocated for migration to the United States, until, at least, a bunch of pesky yanks in thirteen Atlantic colonies decided to stage a republican revolution. British colonists saw these lands as the natural and undeniable future of European – i.e. white – civilisation. Only since the British North America Act of 1931, when Canada gained its own constitution, did that nation open itself up to immigration from outside Europe. And the shadows of colonial Canada resonate not very far from camp. 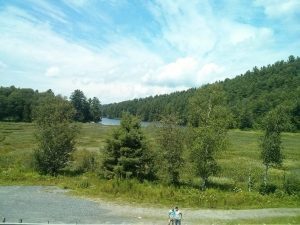 Algonquin National Park was located only an hour’s drive from where I was living. The older campers were often taken on overnight trips there, where they were given the opportunity to go white-water rafting, hike in lush forestry and canoe down fast-flowing rivers. However, as is so often the case with Canada, it is easy to fall in love with the country’s beauty and forget the nation’s past. The Algonquin were a native North American people that were driven out, through a combination of violence, coercion and disease, from their historic homelands around Lake Erie and pushed north. Following the American Revolution in 1776, immigration into the region of Upper Canada – the area of North America that would later become the Canadian province of Ontario – dramatically increased, as loyalist refugees flooded into a land that still remained in the British empire. Yet, in doing so, they destroyed the native homes of the Algonquins, and forced them into an isolated reservation, distant from the urban centres around the Great Lakes. This indigenous people group lay, at best, on the periphery of a growing white Canadian identity. But the effects of British colonisation in Canada have extended beyond the province of Ontario. 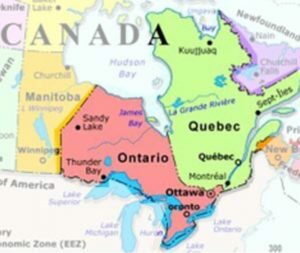 Quebec, to the east, acts as Canada’s only French-speaking province. First colonised by French fur-trappers in the 17th and 18th centuries, France lost jurisdiction over the region after losing in the Seven Years War (1756-63): a conflict fought between Great Britain and France, in part, over competing territorial ambitions in North America. For almost two centuries the British – and after Canada’s confederation as a semi-independent dominion in 1867 – anglophone Canadians tried to suppress the French language, religion and culture of the region. Any trip down the Saint Lawrence river from Montreal – the economic capital of Quebec – to Quebec City – the province’s political capital – will make you aware just how much the people of Quebec value their language. When walking down the streets of Montreal, make sure to say “bonjour” when you order a “crêpe”, not “hello” when you order a “pancake”. The Quebecois fought defiantly against what the British desperately tried to impose on them: linguistic, social, liturgical and cultural uniformity. In a referendum in 1995, after all, Quebec voted only by a margin of 50.5% to 49.5% to remain in Canada. However, for Canadians – at least white, Protestant, anglophone Canadians – the country’s British past is perhaps something to be celebrated. The flags of the provinces of Ontario, British Columbia, and Manitoba all contain allusions to the Union Jack. 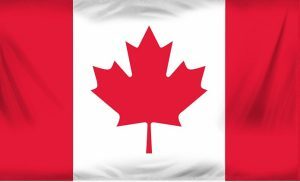 It was only in 1965 did Canadian prime minister Lester B. Pearson, under pressure from Quebec, change its national flag from the ‘red ensign’, littered with pro-British imagery, to its current, and perhaps more iconic, Maple Leaf flag. Despite sharing our monarch, Canada is an independent nation. It is wealthy and democratic, peace-loving and liberal. Yet, the episodes of oppression against indigenous peoples and against French settlers have become conveniently discarded in favour of a glorifying narrative of the nation’s history. The dark shadows of a colonial past have been worryingly swept under the rug, thrown out to the dustbin of history. Of course, the discomforting legacy of the British empire has gone far beyond the North American continent. Our colonial reach included the slave trade from West Africa to the sugar-plantation colonies of the Caribbean. It included the use of indentured servitude in India, the ethnic cleansing of the Aboriginal peoples in Australia, and the establishment of concentration camps in South Africa. We drugged up the Chinese on opium. We starved the Irish. We burned nations to the ground when things did not go our way. We plucky Brits meddled in Malaysia, the Middle-East, and the Mediterranean. The sun, after all, never set on the British empire. It is time to re-assess our relationship with our past. My children on camp live in a nation defined by, and made out of, British colonial rule. Should we wish to do a moral good, we need to respond far more sincerely to the complexities, challenges and darkest elements of our colonial legacy. If we Brits fail to do so, we are, albeit unwittingly, absolving the crimes of our ancestors, and washing away the suffering of those whom we oppressed. It is time that the pages of history be opened.